NOTE: Proper belt tension and pulley alignment must be maintained for maximum drive efficiency and belt life. If belts are too tight, additional load will be placed on the motor and motor bearings. WARNING: Risk of unsafe operation. This unit cycles automatically when the power is on. When performing maintenance, you may be exposed to voltage sources, compressed air, hot surfaces or moving parts. Personal injuries can occur. Before performing any maintenance or repair, always disconnect ("Lock Out" / "Tag Out") the main power source from the compressor, bleed off all air pressure and allow the unit to cool. Do not operate the unit with the shrouds or guards removed. Remove belt guard and loosen the motor mounting bolts. Replace or adjust the belts to be centered in the grooves on the flywheel and motor pulley. Shift the motor back to the point where the correct deflection exists. Tighten two outside motor mounting bolts enough to hold the motor in place for checking pulley and flywheel alignment. The belt should deflect 1/2" (13 mm) at midway between the pulley and the flywheel when a 10-pound (4.6 kg.) weight is applied at the midway point. Check for proper pulley alignment. 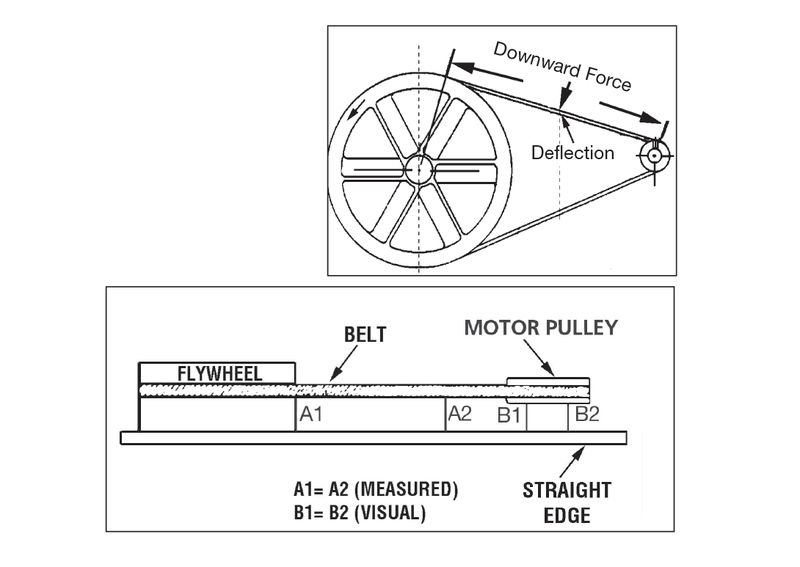 Place a straightedge against the outside of the flywheel and the motor drive pulley. Measure the distance between the edge of the belt and the straightedge at points A1 and A2 in figure. The difference between measurements should be no more than 1/16" (1.6mm). If the difference is greater than 1/16" (1.6mm) loosen the set screw or hub bolts holding the motor drive pulley to the shaft. Adjust the pulley's position on the shaft until the A1 and A2 measurements are within 1/16" (1.6 mm) of each other and retighten too the motor shaft. When proper belt tension is achieved and the pulley is aligned, tighten all four motor mounting screws. Reinstall the belt guard.